Located in the picturesque Onaero Bay is our beautiful beach house. 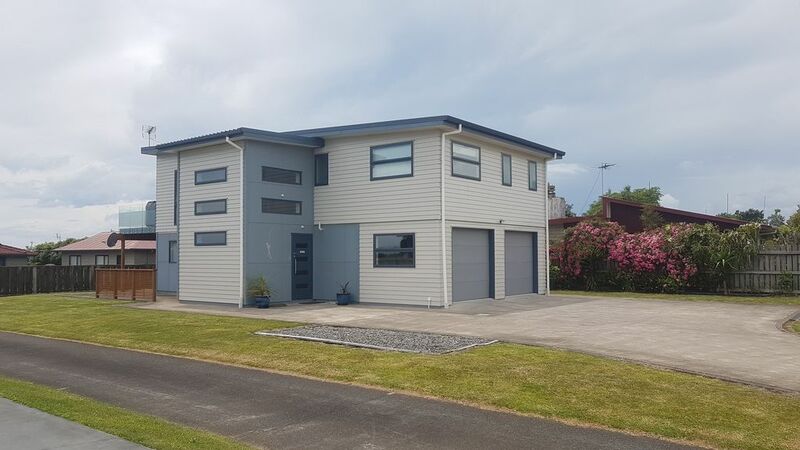 Only a 15 minute drive North from New Plymouth Airport and a 5 minute drive to Urenui, a little holiday retreat with beaches, a 4 Square, fish and chip shop, local tavern, 3 cafes and a 9 hole golf course. Stay and relax on the balcony and enjoy the beautiful sunsets or take a walk along the beach at low tide. Beach access is a little stroll through the reserve or you can meander down the road to build your sand castle, surf, fish or even launch your own boat from the beach or just take a leisurely swim in the ocean. New Plymouth is a 20 minute drive away which boasts the beautiful Pukekura Park, Len Lye Centre, Puke Ariki Museum, Wind Wand, Te Rewa Rewa Bridge, Art Galleries and many more beautiful attractions. The house is fully equipped with everything you need to make your vacation a pleasure, a home away from home experience. This house has everything you need and more. Very spacious, very comfortable and most welcoming.The view from the deck is magnificent. Our family loved staying here and we would definitely go back. One of the most enjoyable holiday stays ever. Thank you Marilize, we would love to have you back someday. We had such a lovely time at this beautiful holiday house. Great views and nearby bush walk to the beach. We would definitely recommend it to others. Justine was an absolute pleasure to deal with! Thank you so much Julie, I'm pleased you enjoyed your stay. We would love to welcome you back at any time. Thank you so much for the last couple of days. Our families were so happy with your place and facilities.very clean. You where right about the bunk beds kids loved them. You have a lovely home and wish we could stay longer. Would definitely recommend this place to all my friend and family.Amazing.